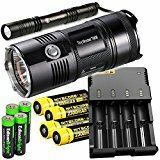 Which is the Brightest Flashlight? 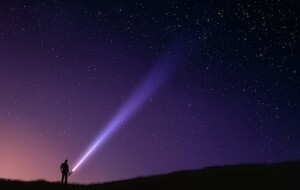 Are you looking for the brightest flashlight? 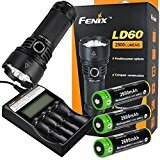 Stuck looking at a hundred different options, lumens, battery type, size and use? We were in the same boat so decided to write up an in-depth review to help you make your choice without the pain of reading hundreds of different articles and reviews. 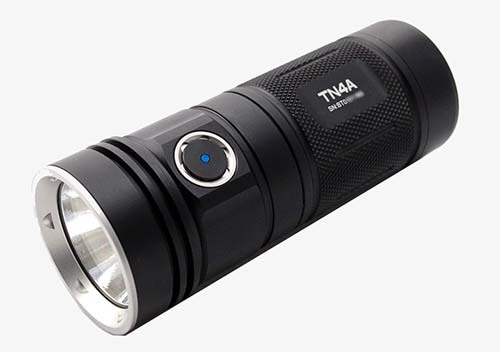 Outside of lumens one of the easiest ways to differentiate between choices is to look at battery type – AA, AAA, 18650 etc and the quantity of each battery as that is how a lot of the flashlight manufacturers describe their products. If you want a quick overview of each of the models we are covering just click on each of the tabs below – conveniently organised into battery options. All flashlights are rated using the ANSI FL1 standards. These standards were introduced in 2009 as a way for manufacturers to perform standardised testing on each of their products. While not all companies subscribe to this process it is the most up to date system available. 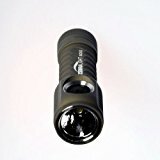 The light output is measured in Lumens – the intensity of the light coming from the front of the flashlight. 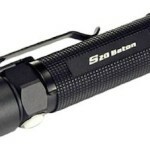 This number is based on the flashlight set to high or full capacity on new or fully charged batteries. The majority of reputable brands will use this number as their max lumens reading when describing their products, while some not-so-reputable brands will list the max output of the LED within the product instead which technically provides a false reading. 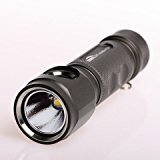 You can get flashlight s that range in lumens from a modest 20 lumens right up to well over 3500 lumens which are, in most cases, too bright for normal use. You also have to consider beam distance when calculating lumens which is described in more detail below. Beam distance is measured in meters and is calculated based on how far the flashlight beam will shine above .25lux. This is equivalent to the brightness of the moon on a clear night and considered bright enough to walk around in. 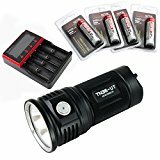 The run time of any good flashlight is measured in hours and stops when the light output drops down to 10% of the output of new batteries. It is not an exact science because the results are rounded either up or down to the nearest 15 mins. Some brands will provide you with a run time graph. 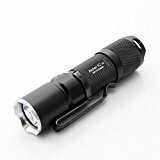 This comes in handy because when your flashlight starts to discharge it very often isn’t a gradual reduction in power. Sometimes your torch may be humming along and then suffer a quick drop off in power. Most of the new models come with indicator lights to let you know well in advance that you are running low on juice and should either change out to new batteries or start charging asap. 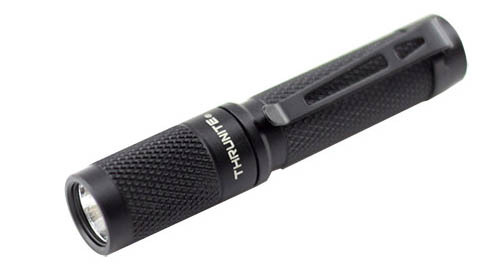 The ThruNite Ti3 penlight is our recommendation for the brightest flashlight that uses a single AAA battery. 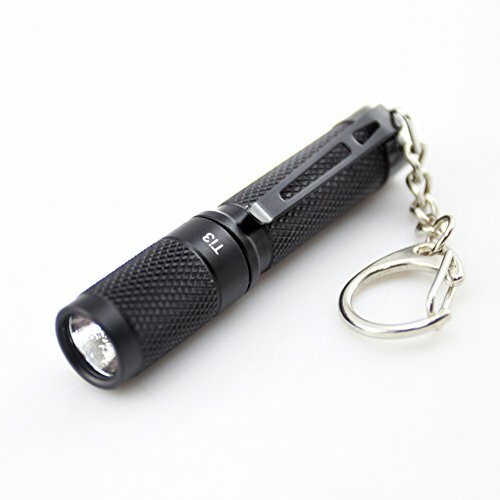 Small and compact this brilliant light fits right in your pocket and can go everywhere with you. Like it’s big brother the Ti4 it’s made from anodized aircraft grade aluminium and works great for everyday use. Using the advanced CREE XP-G2 LED it produces a cold white or neutral white beam. Some instances of questionable build quality. 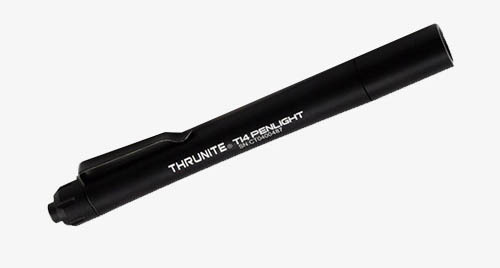 The ThruNite Ti4 penlight is our recommendation for the brightest flashlight that uses AAA batteries. 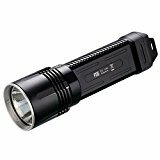 This particular light uses two AAA batteries and outputs a max of 252 lumens on full power. Made from hard anodized aircraft grade aluminium this light feels and works great for everyday use. 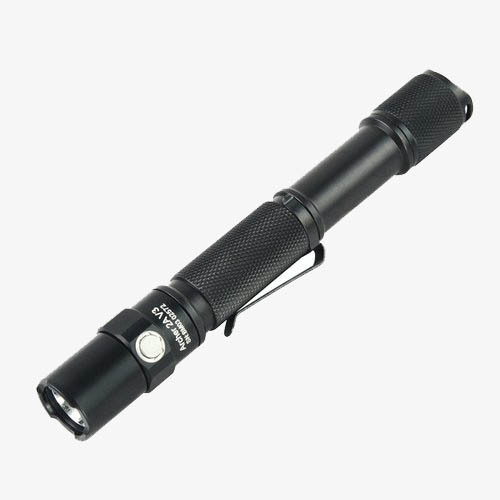 It comes complete with the advanced CREE XP-G2 LED and produces a cold white or neutral white beam. 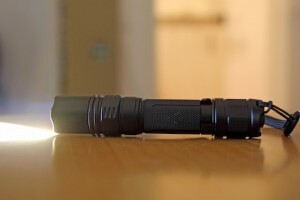 The ThruNite Archer really is a great flashlight. The build quality is top of the line and it performs well above expectations on all fronts. 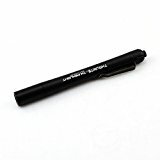 Size wise it’s perfect for your go-to EDC flashlight running a single AA battery or you can switch up to the double AA model if you want that bit more out of your light. 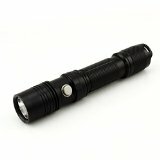 Great for EDC, general utility flashlight, camping and makes a solid inspection light for work. Runs on your normal AA battery or a lot of the guys run Eneloops and have only good things to say about performance etc.. The ThruNite Archer 2A flashlight is our recommendation for the best flashlight that uses 2 x AA batteries. 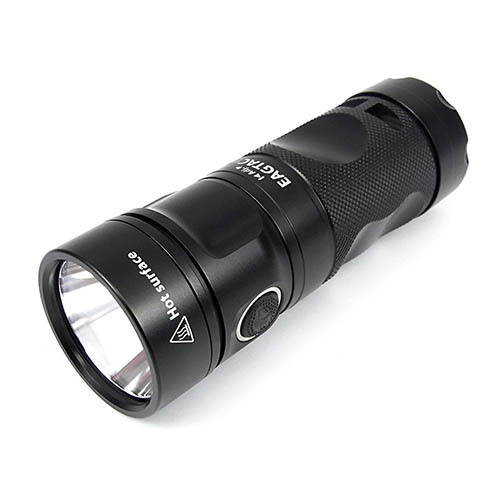 It has a max output of 500 lumens on full power. Similar to the 1A this light is made from hard anodized aircraft grade aluminium this light feels and works great for everyday use. 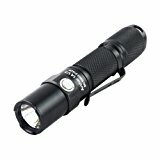 It comes complete with the advanced CREE XP-G2 LED and produces a cold white or neutral white beam. 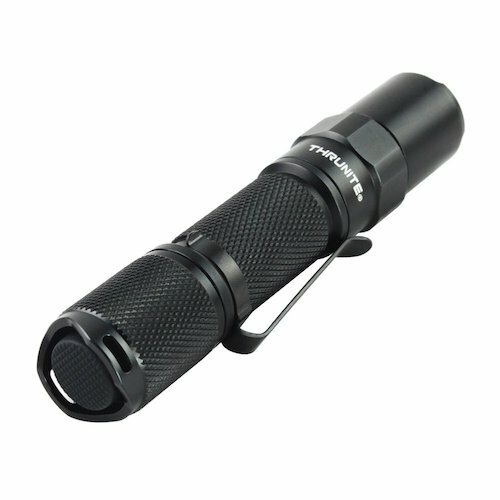 The Eagletac GX25A3 XM-L2 LED Flashlight is a super bright flashlight that runs on 3 x AA normal batteries. 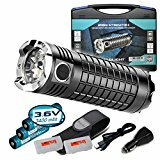 One thing to note though is that if you want to get the full brightness capacity out of this light you should use rechargeable Eneloops or L91 high-drain lithium batteries to drive the super powerful LED. Made from HAIII hard anodized aerospace aluminum it is super tuff and because its IPX-8 you can rough it up a bit in the elements. 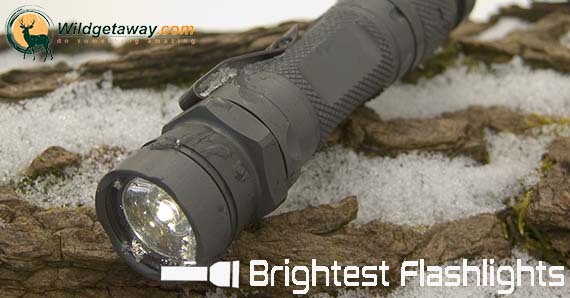 Light comes complete with a sturdy belt holder and lanyard for easy carry. 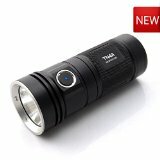 The Thrunite TN4A flashlight is our recommendation for the best flashlight that uses 4 x AA batteries. 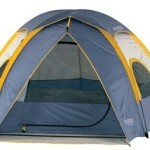 It has a max output of 1050 lumens on full power. You will want to set this up with pro Eneloops to get the most out of it. Turbo mode is immensly bright but you will chew through batteries fairly quickly. The normal mode is plenty bright for the majority of use cases any way so nothing to worry about. 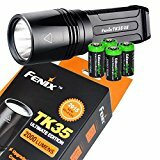 Compact enough flashlight but probably a bit bulky for EDC use. 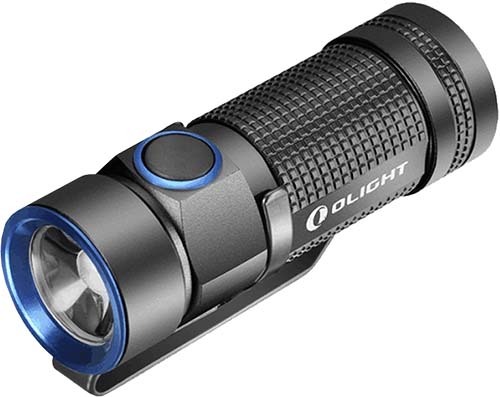 The Olight S1 EA41 is a great flashlight for EDC use and is one of our favourite tactical flashlights. Small and compact but with plenty of power. Comes with a moonlight mode which is a great addition. This pack come’s complete with charging unit and a CR123A rechargeable battery so you are ready to go. The magnet end cap is handy if you are working and need both hands free – just stick it to a metal surface and work away.